We looked up past neat strips of vineyards to panoramic views of the castles silhouetted on the top of hills on either side. Early on, we passed Lorelai, a 132-foot steep slate rock with folkloric associations, including a bewitching woman who could lure ship captains to disaster and dwarfs who lived inside. As we moved along, the cruise director gave excellent commentary along with eerie legends that went back centuries. Many of the castles had suffered heavy damage during the Thirty Years’ war between France and Germany, and had either been left in ruins or rebuilt so that they were private homes. 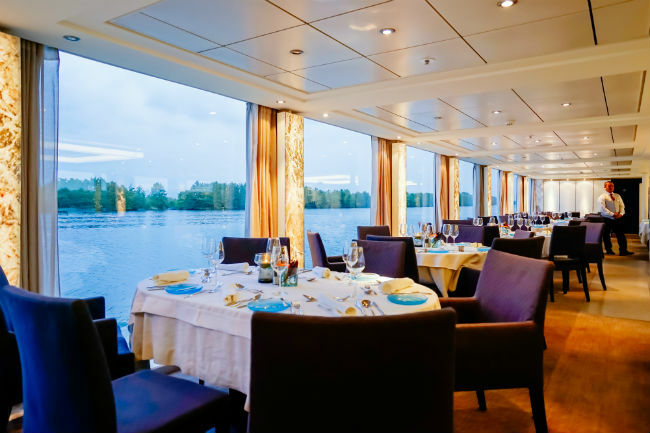 During this time, we relaxed in the glass-enclosed Aquavit Terrace at the front of the boat or in one of the lounges, all of which had good spots with comfortable seating for panoramic views. On the last day, we drove to Paris, stopping for a brief walk through the historic center of Luxembourg, built high up on hills that dip down into forested gorges. We also strolled through the American Cemetery where many casualties from the Battle of the Bulge are buried. 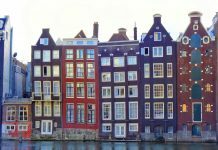 The Viking river cruise certainly helped us put together some pieces in that vast jigsaw puzzle of European history, as well as providing excellent cuisine and comfortable digs. Author Bio: Emilie C. Harting has been published in the Philadelphia Inquirer, The Miami Herald, the Los Angeles Times, Dallas News and many other major publications. She has also written books on literary places in Britain and New England, and on Staten Island, New York.